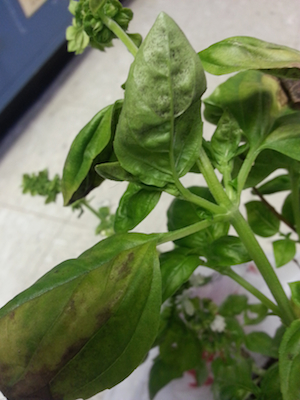 Basil downy mildew on overwintered sweet basil plant. Note symptoms on leaf top side and downy mildew spores on leaf underside. Well, before I could come up with a good answer, basil downy mildew was found in a high tunnel in Salem County today. I don’t have any of the details from the VA report yet, but I do have a lot of information from New Jersey. The infected plants in question, roughly 12 mature potted sweet basil plants, were just a few plants that were left over from last fall and carried over the winter in a non-heated high tunnel on benches with heated mats and row cover. The heated mats and row cover were for protecting other crops. Interestingly, the basil did not freeze out, somehow managed to survive the winter without much heat, and produce downy mildew spores once the outside temperatures rose. The important thing for everyone to remember here is to be careful with what you are overwintering in your greenhouse and/or high tunnels! Remember, forgotten plants, old plant tissue/organic matter/discarded soil can all harbor pathogens that you may not be aware of. If the sweet basil in question here would have froze out (which may have been what was expected) then the threat of downy mildew would have died with it since basil downy mildew is an obligate pathogen and NEEDS a living host to survive. Many others pathogens just need organic matter. If you are growing basil late into the fall in a greenhouse or high tunnel or starting it early in the spring, you need to have a basil-free period of a few weeks to remove the threat of harboring or overwintering basil downy mildew in your operation.